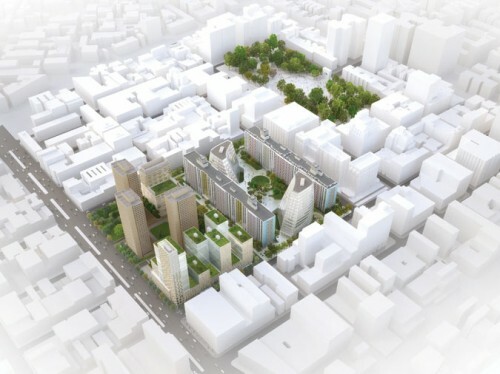 Arial view of NYU's expansion plans. Manhattan Community Board 2 unanimously voted against the NYU expansion plan in Greenwich Village last night citing the impact its scale would have on the neighborhood. 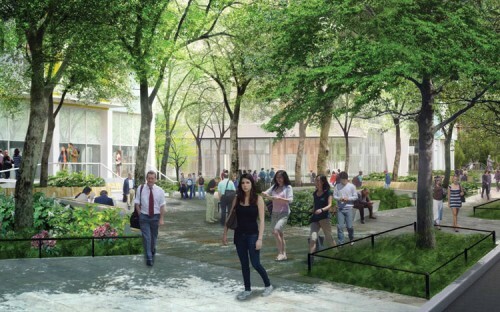 Grimshaw with Toshiko Mori designed four of the proposed towers and Michael Van Valkenburgh designed the landscape for the 2.4 million square foot expansion. The plans were set within two superblocks that sprang from Robert Moses-era urban renewal projects that featured buildings by I.M. Pei, Paul Lester Weiner, and a garden by Hideo Sasaki. Cross section reveals expansive underground complex. Of the many proposed elements that the board took issue with, density topped the list. Nearly one million square feet would sit below grade. “They kind of gamed the zoning resolution,” said David Gruber, co-chair of CB2’s NYU Working Group. “The zoning talks about density, but that only counts above ground. There was so much underground but that doesn’t get picked up in the zoning resolution.” Even with the below grade component going under the FAR radar, Gruber said that the plan still needs six zoning changes. And though half of the project wouldn’t be seen from the street, the 12,000 extra pedestrians coming to and fro would be. NYU’s vice president of government affairs, Alicia Hurley said that the university was unique in their ability to utilize windowless, underground space, as they can use it for lecture halls, classrooms, auditoriums, and studios. “The thing we’re trying to have people understand is that we know we’re going to have needs for facilities, we’re already thinking of other parts of the city,” she said, referencing downtown Brooklyn and the hospital campus on Manhattan’s East Side. “We are trying to do as much on our own footprint, to limit the spread out into other communities.” After several months of shepherding the proposal through contentious committee meetings, Hurley said that she wasn’t surprised by the vote. 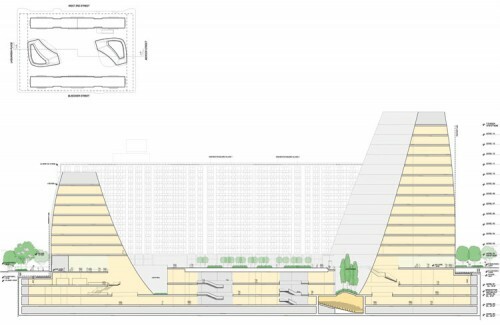 New park space would sit atop the underground complex.